Price for one, £895 | Price for a pair, £1695. Full all-inclusive aftercare package and five year guarantee included. 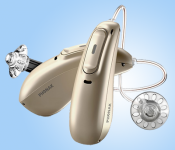 The Phonak Marvel M30 is the most basic aid in Phonak's Marvel range. These aids are solid, if basic aids for people with fairly low requirements who mainly need to hear well for one-on-one conversations and watching television, but don't intend to use them much when out and about in places with more going on and background noise. What sets these aids apart from previous generations of Phonak products, is that usually there is no rechargeable option for the 30 model. Now there is, and at no extra cost. The battery is just as good, it's the second gen Lithium-Ion one, same as the one in the top model, the M90, so you will still get a full day's hearing without needing to recharge.